We no longer carry the 1983 Mustang TMI Seat Upholstery Black Leather Convertible. 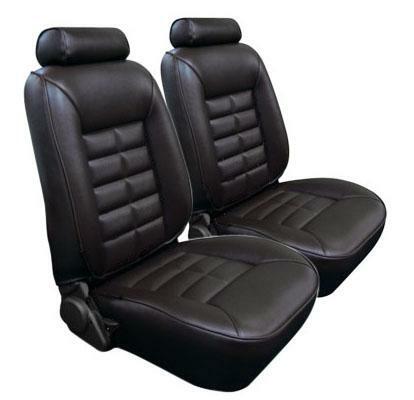 Check out 1979-1993 Mustang Upholstery for an updated selection. If the seat upholstery in your Fox body Mustang is faded and ripped, look no further! 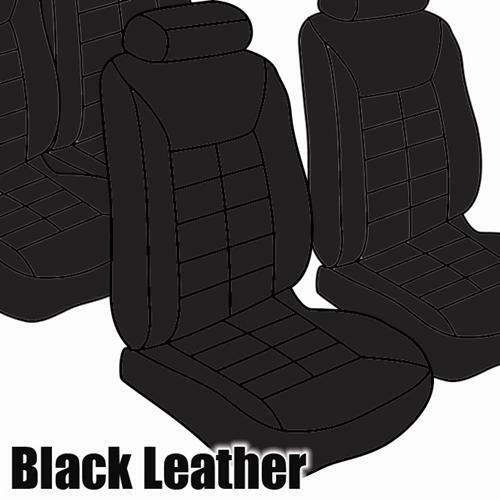 LRS has you covered, with high quality reproduction Mustang seat upholstery. Don't settle for tattered seats, replace them today! This reproduction Mustang Seat Upholstery is intended for GLX/GT trim level 1983 Mustang Convertible with low back front bucket seats. The upholstery features vinyl back & sides with a leather seating surface. The color is Black & is correct for interior trim code EA. Low Back front seats have a small headrest. If the seats in your Mustang have seen better days, a set of new seat upholstery for your Fox body Mustang is just the ticket! Just follow the instructions on our Mustang seat upholstery installation blog by removing the factory seat upholstery and re-cover your Mustang seats with this reproduction kit to make the seats in your Mustang look and feel like new again. This standard Mustang cloth/vinyl/leather upholstery kit features OE style patterns to match the seats that your Mustang came with from the factory. The material used is not factory correct, but is the closest match currently available. If you are in the market for new seat upholstery for your Mustang, more than likely, you also need to invest in new some new Mustang seat foam. Over time the seat foam in your Mustang will deteriorate, to reveal the seat frame below. Not only is this very uncomfortable to sit on, but can also cause lower back pain. Our seat foam is sold individually so there is no need to purchase seat foam for the passenger side if it's still in good shape. Do your back a favor and check into a fresh set of seat foam today! - Does both front and back seats! TMI is the only interior manufacturer that offers a Limited Lifetime Warranty. This will cover any workmanship errors caused by the manufacturer and does not cover installation errors or normal wear and tear.